Stella Artois is taking an unusual tack with its Super Bowl ad: asking viewers to support a cause by buying its products. The Anheuser-Busch InBev brand, which announced back in September that it would be returning to the Super Bowl for the first time since 2011, released the ad online today. The 30-second spot (below), “Taps,” from the Mother agency, features actor Matt Damon, co-founder of Water.org. It marks the start of Stella Artois’s fourth annual “Buy a Lady a Drink” campaign in partnership with the nonprofit, which develops and delivers solutions to the global water crisis. Against a backdrop of clips of people in developing countries walking miles to collect water, Damon explains the crisis and encourages viewers to help by responding to cause-related offers from the beer brand. Now through April 15 of this year, each purchase of a Stella Artois (or Stella Artois Cidre) 12-pack (bottles or cans) will go to help Water.org provide 12 months of clean water for one person in the developing world. Each purchase of a pint or bottle of the brand at a bar will help provide one month of clean water. And as in years past, during 2018, each purchase of a limited-edition Stella Artois Chalice will help provide five years of clean water for one person in the developing world. 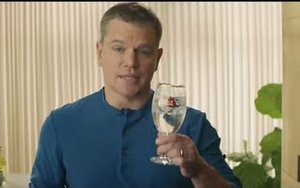 “If just 1% of viewers watching the Super Bowl this year purchased a Chalice, we could help provide access to clean water for up to 1 million people in need,” Damon stated in announcing the ad’s release. To kick off the campaign today, Damon also appeared at a “Make Your Super Bowl Matter”-themed event in New York City, with free beer for the first 100 attendees. The ad is being released well in advance of the big game to enable encouraging consumers to consider choosing Stella Artois when they stock up for their Super Bowl parties, according to Stella Artois VP Harry Lewis. To date, Stella Artois has helped provide more than 1 million people with access to five years of clean water, through the sale of more than 500,000 limited-edition chalices and through direct donations of more than $8 million to Water.org. The scope of the assistance has expanded since the campaign’s inception, and now reaches 10 countries, including Mexico, India, the Philippines, Australia, South Africa, Brazil, Chile and Uruguay. Why take the leap of promoting the initiative at this year’s Super Bowl?